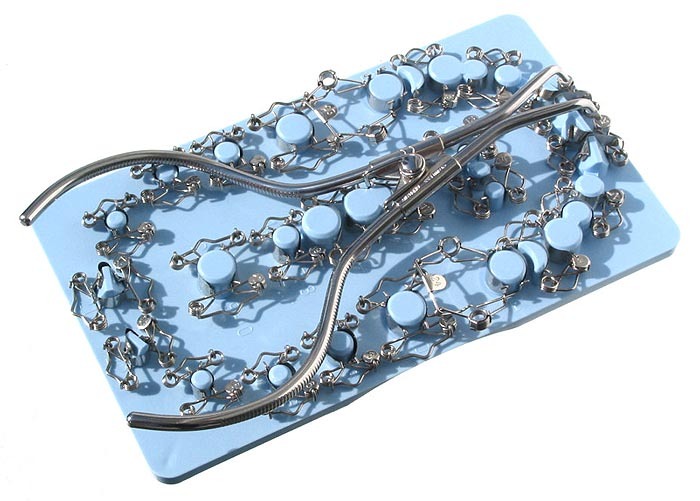 There are three sectional matrix system sets with WALSER® Matrix Forceps as well as a Kids Kit. 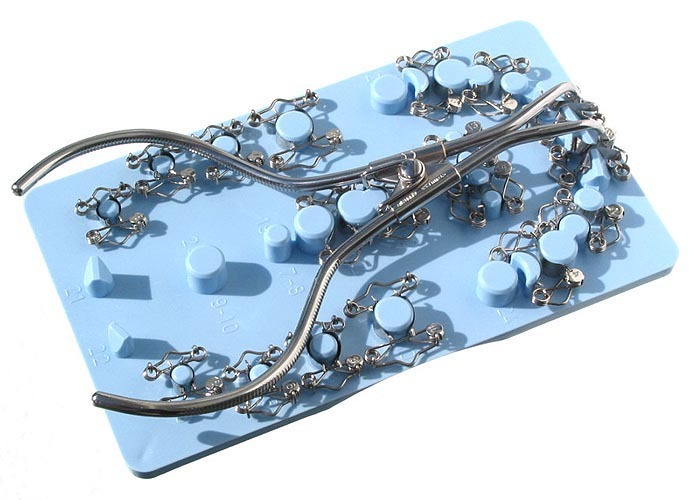 All matrices as well as the trays (except foam material tray Kids Kit) are sterilisable, repeatedly usable up to two years. Each Walser® tooth matrix set includes a stand-up display made from a special plastic. 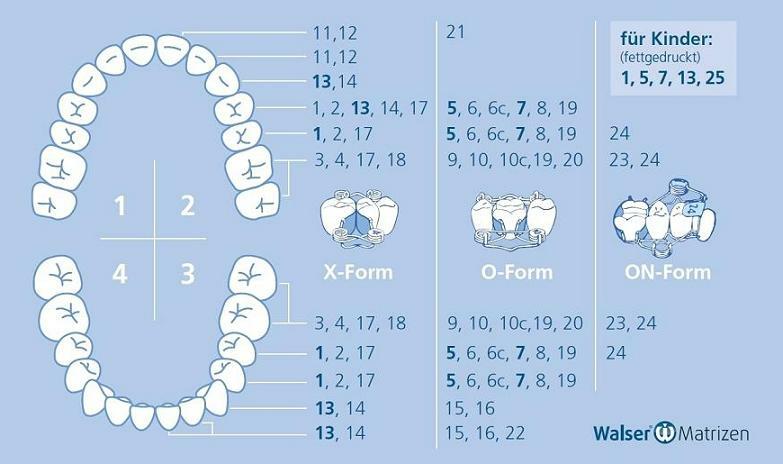 Just one look and you see, which matrix can be used for which tooth in the upper and the lower jaw. Also the matrices for children are listed neatly. Request your bestseller here today! Dr Damouras says: "I've become much faster with my filling therapies through the Walser matrices"
"Dear Sirs, I am a user of Walser matrices since many years. I get on super with the Walser matrices. Particularly benefial is the good tightening against blood and saliva. Since I work with Walser matrices I am much faster with doing fillings." This set consists of the matrices nos. 1 to 18, i.e. with the addition of the front matrices no. 11, 12, and the extra tall X-shapes 17 and 18. The matrices are placed on a matrix tray. Request your set of 18 here today! This set consists of the Walser® Matrices nos. 1 to 10 (except no. 6c and no. 10c), i.e. 4 X-shape matrices and 6 O-shape matrices with two strip heights. The matrices are placed on a matrix tray, and fulfill in every aspect all the requirements for a matrix used in the premolar and molar area. Request your set of 10 here today! 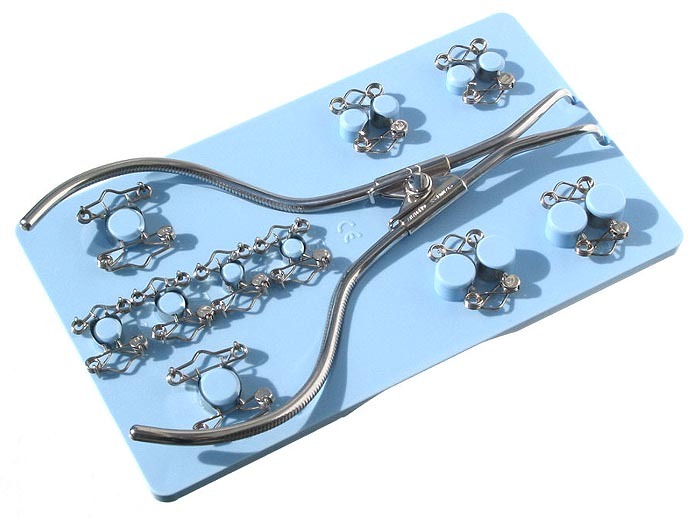 This Set includes the WALSER® forceps, the WALSER® matrices nos. 1, 5, 7, 13, 25, i.e. 2 pcs X- and 3 pcs O-shape matrices. The matrices are placed in a foam material tray. Since things have to move faster with children, they are excellently suitable when treating children.